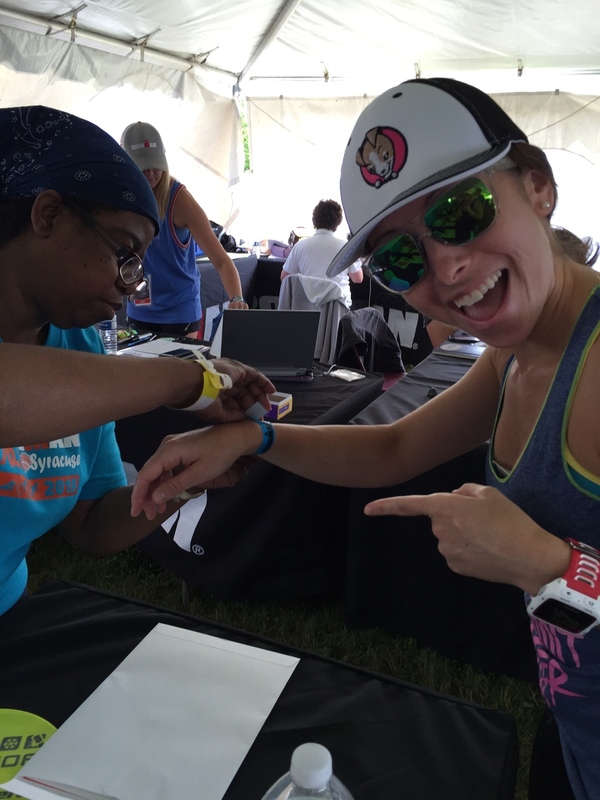 This past Sunday, June 21st, I raced Ironman Syracuse 70.3. The hilly race was the toughest event I’ve taken on yet, with a rolling course that had most of my team stressed for the past few months. I’ve completed this distance once before, but this race deserves it’s own category for its elevation gains. Those hills….I mean, HELLO. 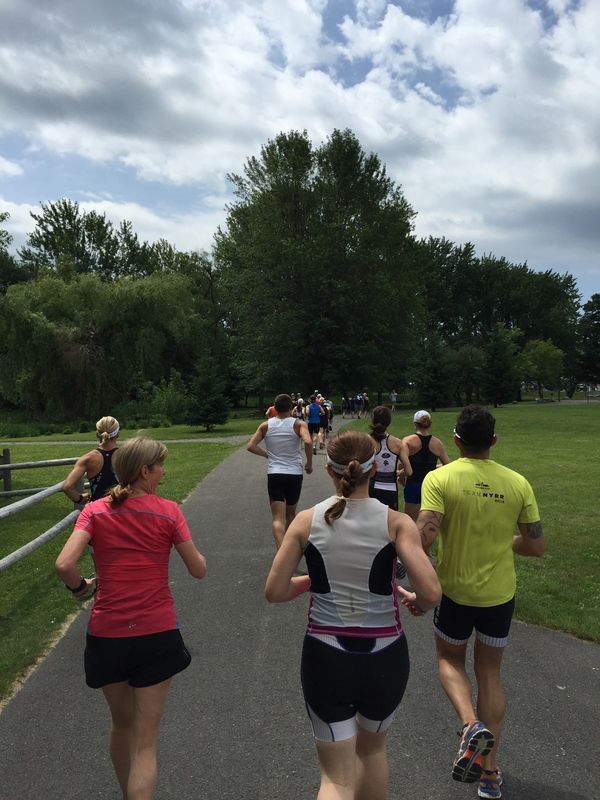 Soon after some of us signed up for this race, we realized we had some work to do. Sure, the distance was attainable given our training thus far, but the hills on both the bike and run course were no joke. We all spent many mornings riding on our computrainers in T2, previewing that Syracuse course, and shedding a tear from time to time. Turned out, the first 12 miles was to be one big, long, nasty climb. An hour of grinding gears and moving at 6mph was not a feat we were excited to take on. But we paid and agreed, so we had no choice but to train hard and get those hill repeats in. This race was always going to be our way to test what we were really capable of. Last Friday we all headed out at separate times…our car leaving around 5pm…and made our way to Syracuse, New York. On the long journey, invaded by some traffic, we sought out a proper dining establishment so we could get our carbs on. (You know, your dinner two days out is just as, if not more important than the meal the night before the race). 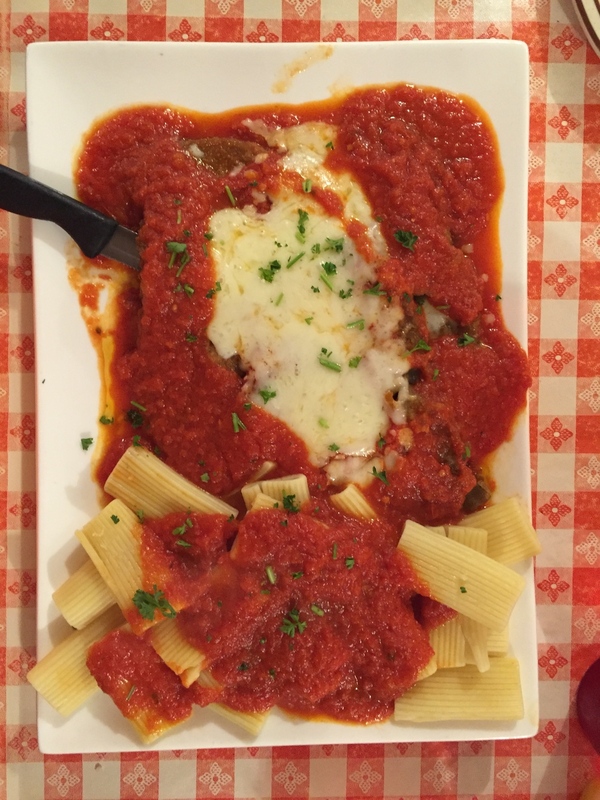 We finally came across an Italian restaurant in Roscoe, NY and sat down to consume some chicken parmigiana, pasta, and ample amounts of bread and olive oil. I was stuffed but satisfied and now I just needed a bed. We arrived at our hotel around 11 or so, and crashed so fast. Rest was so important - Saturday was to be a big day of prep and last minute training. Saturday we rose for breakfast and packed our day bags with gear for all three disciplines. We were set to swim, bike and run parts of the Syracuse course to sample the action we would take on on Sunday. At the race sight, we checked in, got our bibs, took some pics, you know, the usual. (During check-in I met fellow triathlete & blogger Xavier from Asphalt Green. Glad you found me, friend!) Then coach Robert had us run around the site to check out the area and asses the transition area. Soon after, we un-racked our bikes and clipped in to ride a portion of the run course, which made most of us cringe when we realized just how big some of those hills were. 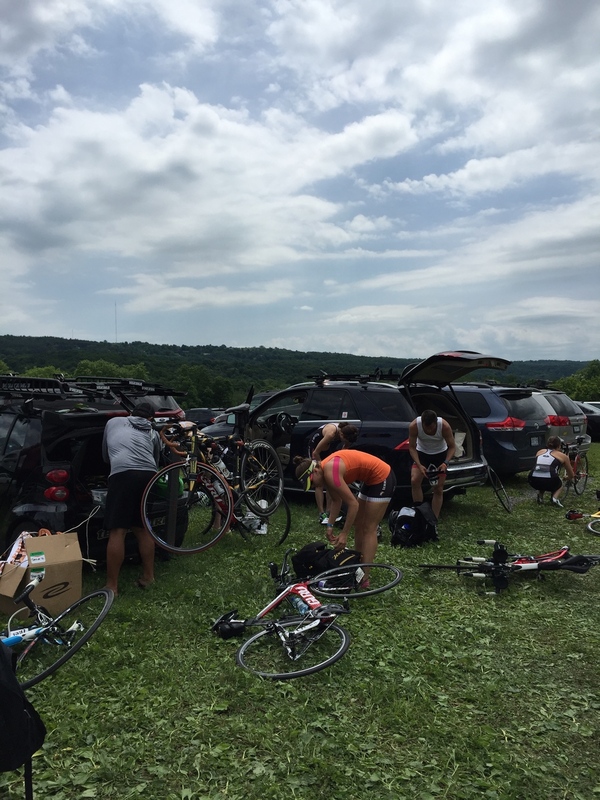 Later, after racking our bikes, we hopped in the Jamesville lake to test the waters and get a feel for what the swim would be like the next morning. I only swam 200 yards or so and I was covered in seaweed. It was annoying, but it would not get in the way of what I came to do, which is conquer. After that swim, it was 2pm and we all needed a nap before dinner, so we quickly got some food and then got back to the hotel for some shut eye before the next meal. Our team dinners are always fun, and we genuinely enjoying spending time together which is amazingly convenient. We share a lot of laughs, talk triathlon, and eat like kings. I had a simple bowl of penne with grilled chicken and red sauce. Always is my go-to pre-race dinner. After stuffing our faces, Robert gave us one more speech to calm our nerves and send us home with the reassurance that we’ve trained hard for this. It was true - we had the ammunition to get us over those hills, whether we cared to believe it or not. Back at the hotel, I laid out all my belongings and started to arrange my gear spread. Tara and I talked through our strategies for nutrition and then watched some tire changing you tube videos to remind us how to do the thing we both deeply pray we never have to experience…changing a flat during a race. UGH. It gives me chills just to think about it. But soon we were all packed and got to bed. I slept as the rain poured down outside, leaving us a little uncertain about how the weather would hold up for our race. Only time would tell. After much traffic leading into the parking lot, we get to the site and it’s POURING. I swear I saw people walking back to their cars and calling it quits. With a tough course like this, a lot of people can easily fear riding in such conditions. I am one of those people. But I am also cheap and stubborn so if I pay the price and do the training, I am doing the race! So I took a deep breath and started the long, wet trek to transition to start my setup. Everything was arranged in plastic bags to keep my gear dry. I filled my bottles, laid out my nutrition, grabbed my wetsuit and headed to swim start with 10 minutes till take off. The rain subsided in time for the gun to go off, which was a sigh of relief. Wind, rain or shine, it was GO TIME. 7:16am I was off. I stayed at the back of the pack, as usual, so that the crazy swimmers could get ahead and I would be safe from a kick or punch to the face (ain’t that the worst!?) I always feel slight panic early on but that’s only because the waters are rougher and everyone is trying to find their piece of the lake to claim. Well, I soon found mine, more to the outside of the group, furthest from the buoys, which is where I feel most comfortable and can get in my groove. I soon realized I didn’t pull my wetsuit up enough because my next was being slightly choked. Oh the joys of this sport! Then I started to get tangled up in seaweed which was pleasant. But I soldiered on and I swam pretty well, knocking off a negative split with a faster second half, ending in a kick fest to the swim out. I emerged from the water smiling, sans seaweed, and when I looked at my watch I was pleasantly surprised with my time - 39 minutes…almost a 5 minute PR! After the wetsuit strippers helped me get my seal suit off, I was off to transition 1 where I was my usual slow self. (I’d rather be slow & prepared over fast & forgetful). A long ride out of transition to the bike start was muddy and mucky, but these are things we have no control over. I was focused on getting into a positive mindset as the first 12 miles would be one big climb. This climb is one we have trained for and one that scared us to pieces in computrainer class. I had about 5 minutes to settle in, get in some fluids and take a deep breath, and then the hills began. The rolling countryside of Syracuse is no joke. My downhills were up to 40mph (and death was on my mind the entire time) and my uphills were as slow as 4mph. I found myself, along with others, huffing and puffing up a few nasty peaks that felt never ending. It never really did even out…the whole 56 miles was uphill, just at different grades. I eased in to the smaller hills and found myself practicing my aero handling and sipping my fluids thanks to my watch’s 15-minute reminder. I tried my hardest not to get bored and more so, not get discouraged about those passing me. My heart rate was always moderate (except on the big hills) and I never pushed it to be honest. Maybe I should have more? A few WINS: rode in aero for a decent amount of time, took fluid from bottle exchange and poured into front hydration bottle without losing balance, not dying on the downhills, no flats. LOSSES: I swallowed a bug whole, I didn’t have enough nutrition, I could’ve rode aero a little more, and it rained the last 10 miles. But I finished with a time of 3 hours and 29 minutes, which equated to an average of 16mph. Pretty crazy that I was actually 6 minutes faster on this course than on the flat course of Princeton last fall. I was proud. And stunned. My second transition was slow as I switched from bike to run gear, took in some fluids and ate a few chews, then stopped at a port-a-potty. (I have no shame in stopping for the bathroom. Hell, this is a long race!) My legs were pretty fresh at first and I started to knock off decent mile times. Then at mile 3 I saw IT…yes…IT…the nasty hill I heard so much about. That hill would attack now at 3 and again at mile 9. I tried to run up it, but like most people around me, I ended up walking until it flattened at the top. At least I used that time to breathe through a few oncoming cramps and take in some nutrition. The hills seemed endless, probably because they were. It was hot, but there was little sun, mostly humidity. I took a sponge at every aid station and that was my saving grace. I split the out and back course into it’s two pieces - the first half I would be “warming up” and pretending that this was not even happening - like a dry run. The second half was my 10k, the “real” part of the race, where I would hone in on the finish line and give it my all. At mile 10, I looked at my watch, which I hadn’t done since the swim, and I suddenly realized, I was unexpectedly going to PR this race! My mood skyrocketed and I knew I just had to stay under a 10-minute mile to get to that finish in time, which was totally doable. Before I knew it, I was flying through the course, smiling ear to ear and talking to everyone on my way to the finish shoot. Pain was lessened because emotions were high. Then I saw it…the finish line…the cheering crowds…my coach and teammates…and I screamed “I’M GOING TO PR!!! !” I think that was captured in photos. I raced home and threw my hands up, happiness and triumph filling my heart. I had done it. I had said in an Instagram post the night before the event that I would certainly not PR this race because it was such a tough course. Well, I clearly doubted myself and set the bar low, because the turnout was quite the opposite. I PR’d by 11 minutes, with a 6:29 finish, and I did that on a course that was 10x harder than my first. THAT is accomplishment. And I hope you, me and everyone else in this world gives themselves more credit when they set out on a physical journey. Train well, be patient, and have hope…and you too will surpass your expectations. I am sad to say that after I crossed the finish, a horrendous (yet short) storm set in and race officials had to remove the rest of the runners from the course, leaving many to DNF (did not finish), including some of our own on Terrier Tri. Safety is top of mind, but it was still unfortunate to see, especially when some of them only had a mile to go. Eventually the storm cleared and we headed for home, stopping back at that Italian restaurant we ate at on Friday night to pig out on more parmigiana dishes with pizza as an appetizer. hehe. Monday I felt pretty fresh and Tuesday I was back in the pool swimming 3000 yards. The cycle is back on! I have the NYC Triathlon in 4 weeks and my full Ironman in Mont Tremblant is in 8 weeks. Yikes! Ironman Syracuse 70.3 was a challenge I will never forget and always be proud of myself for conquering. I’m not the fastest racer, and I don’t ever need to be. We all should enjoy this, and enjoy seeing what hard work leads to.